Minimum Wage. All employees covered by this order, other than tipped employees, shall be paid no less than:a. $10.15 per hour after the effective date of this Executive Order;b. Beginning January 1, 2017, and annually thereafter, an amount that is no less than the amount previously in effect; increased from such amount by the annual percentage increase in the Consumer Price Index for Urban Wage Earners and Clerical Workers (United States city average, all items, not seasonally adjusted), or its successor publication as determined by the United States Bureau of Labor Statistics; and rounded to the nearest multiple of $0.05. The applicable adjusted amount shall be published in the Pennsylvania Bulletin by March 1 of each year to be effective the following July 1. (3) spend at least 20 percent of their working time in a given work week performing an ancillary service called for in a new lease of property or contract for services or construction exceeding the applicable small purchase threshold entered into with a Commonwealth agency under the jurisdiction of the Governor, including bilateral modifications to existing such leases or contracts, after the effective date of this Executive Order. Implementation. All Commonwealth agencies under the jurisdiction of the Governor shall take all steps necessary to implement this Executive Order. Independent agencies, state-affiliated entities, and state-related institutions are also strongly encouraged to implement this Executive Order. Sanctions. Failure of a covered contractor or lessor to comply with the provisions of this Executive Order may result in the imposition of sanctions, which may include, but shall not be limited to, termination of the contract or lease, nonpayment, debarment or referral to the Office of General Counsel for appropriate civil or criminal referral. (2) Any state or local policy requiring a covered employee to be paid more than the minimum wage required by this Executive Order. b. The provisions of this Executive Order shall not be applicable when such provisions may jeopardize the receipt of Federal funds. 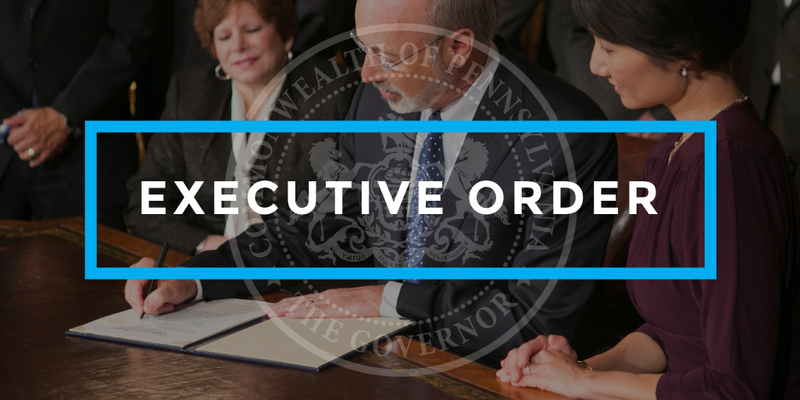 c. This Executive Order is not intended to, and does not, create any right or benefit, substantive or procedural, enforceable at law or in equity by any party against the Commonwealth of Pennsylvania, its departments, agencies or entities, its officers, employees or agents, or any other person. Effective Dates. This Executive Order shall take effect on the following dates and shall remain in effect until modified or rescinded:a. For employees described in Section 2(a) of this Executive Order, immediately.b. For employees described in Section 2(b) of this Executive Order, on the effective date of the applicable contract or lease solicited or bilaterally modified on or after July 1, 2016.